Last week I spoke with Tayo Branston, the drummer and a vocalist from the seasoned and electrifying musical outfit Five Alarm Funk. We had a chance to talk briefly about the kick-off to their 5th cross-country tour happening at Tall Tree this weekend, and about how the nine-man team will keep up their act through the over 20 concert dates they have confirmed this summer. I wanted to know how Tayo and the group get around during their tour, thinking a band their size must have a challenging time coordinating such an epic annual road trip. He told me that this weekend they will be flying straight from Saskatchewan Jazz Festival, but normally would have the comfort of their (former airport) shuttle bus, which has been converted into the band’s mobile lazy-boy living room. We all know how physically and mentally draining a wild weekend at Tall Tree can be, or any music festival for that matter. I wanted to know how Tayo and Five Alarm keep up with their demanding schedule every summer, touring the country in under two months. Tayo says that maintaining energy is a challenge but knowing when to give it and when to step back counts big time. Tayo also told me that the band tours with a health-conscious chef, who prepares meals for nine well-deserving men every step of the way. Tayo told me that Five Alarm has neither played nor attended the festival, but are looking forward to having their Tall-cherry-Tree popped. 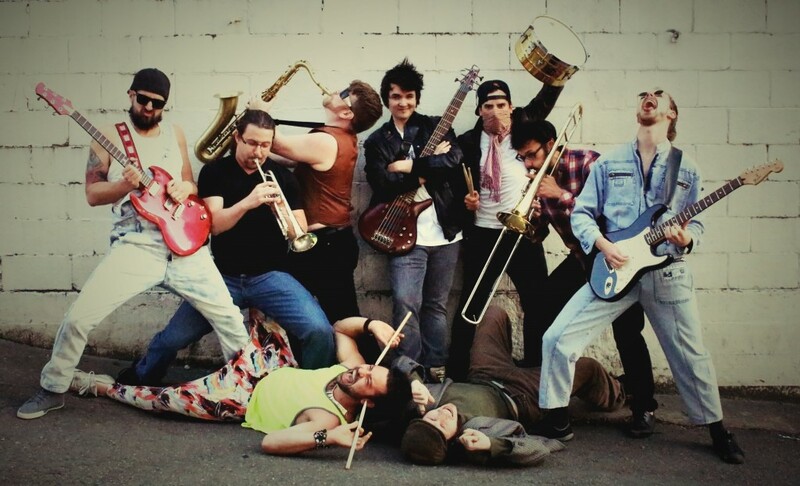 Five Alarm Funk perform Sunday on the Main Stage, so stay sharp and well hydrated, cause we don’t rest on Sundays at Tall Tree, we dance and POP CHERRIES. Thanks Tayo! See you on the mountain. Words by Contributing Writer: Jimmy Leitch.